This summer season has been interesting for growing tomatoes. 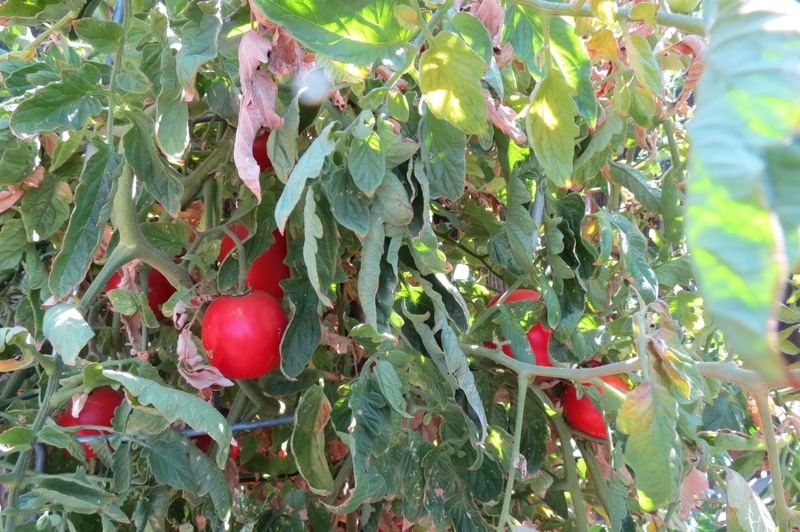 First of all, the weather was too cool for the tomatoes to ripen, then it became so hot that they cooked on the plants. Fortunately, I was able to save enough of the fruits for my family, other relatives and a few neighbors to enjoy. And when I say enjoy, I MEAN IT! I ask you is there anything better than a fresh picked tomato BLT? According to Wikipedia the word "tomato" may refer to the plant (Solanum lycopersicum) or the edible, typically red, fruit that it bears. Originating in South America, the tomato was spread around the world following the Spanish colonization. I was surprised how much I learned about growing tomatoes because I am a "newbie" Master Gardener (2012). Based on my recent knowledge, I was pretty successful growing tomatoes. First of all, I purchased resistant plants such as 'Ace Hybrid',' Better Boy',' Celebrity', and 'Early Girl'. I did experiment with a plant of miniature fruits called 'Black Cherry'. which turned out to be a large plant. I saved the seeds and next year will not plant it in a large pot; but will plant it in the ground as I did the others. I had such fun recognizing the beneficial insects such as California native bees and lady beetles crawling and flying on the plants. The only pests I had to deal with were a few aphids which a good stream of water was a quick solution. Speaking of water, I am certain that watering the plants deeply and less often than I used to helped them to stay healthy and strong. Of course, in Vacaville which can record temperatures of triple digits in June and July does mean more watering. However, by concentrating the water into the roots and not the leaves appeared to be helpful in preventing other problems. Another fun project was using tomato's in a new recipe a friend sent me called, Chunky Tomato Basil Soup. It was quite tasty. At the Fairfield Tomato Festival I was given directions for a Tightening Tomato Facial Mask. Oh, how much fun one can have with this little round fruit! Those gorgeous tomatoes in your garden look yummy, Danielle. Good article.